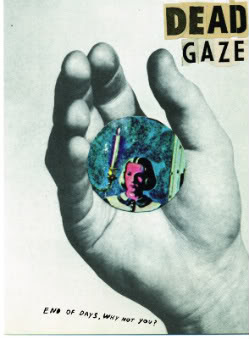 DEAD GAZE, once the bedroom project of Jacksonian COLE FURLOW, is now a full-fledged band, and they have a new cassette out via the excellent Charleston, SC label MIRROR UNIVERSE TAPES (Washed Out, Toro Y Moi, Weed Diamond, Truman Peyote, etc). End of Days, Why Not You? is limited to 100 copies, so click HERE to order the damn thing. Or, if for some strange reason you'll be at SXSW in Austin this week, DEAD GAZE will be selling the cassette there. They've got a bunch of shows lined up, including SHAKE SOME ACTION!, an unofficial 3-day extravaganza organized by a bunch of our very favorite internet dweebs. We'll be posting more info on Mississippi bands at SXSW, so stay tuned!